Since the early 1980’s when Ford released the now famous 5.0L HO engine, Flowmaster- Equipped Mustangs have become the signature sound of the modern muscle car era. Flowmaster’s new axle-back system for the latest generation of 05-09 Mustang’s delivers improved performance, looks and a sound reminiscent of those early 5.0L cars. Featuring Classic square cased 40 Series® mufflers, the kit follows the factory exhaust routing, utilizes the factory hanger mounting points and includes all necessary mounting hardware for an easy and perfect fitment. 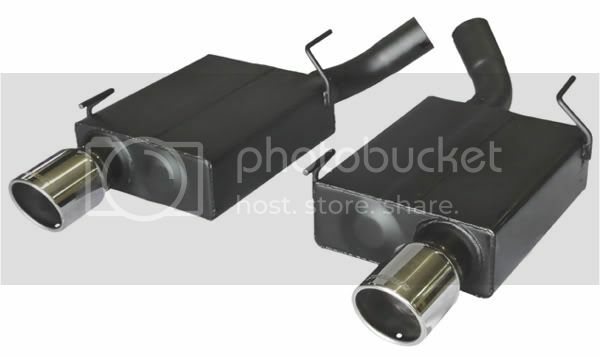 Designed for the serious enthusiast who really wants to hear their pony breathe, these mufflers produce a deep and aggressive exterior tone on the throttle, along with a considerable amount of interior sound.